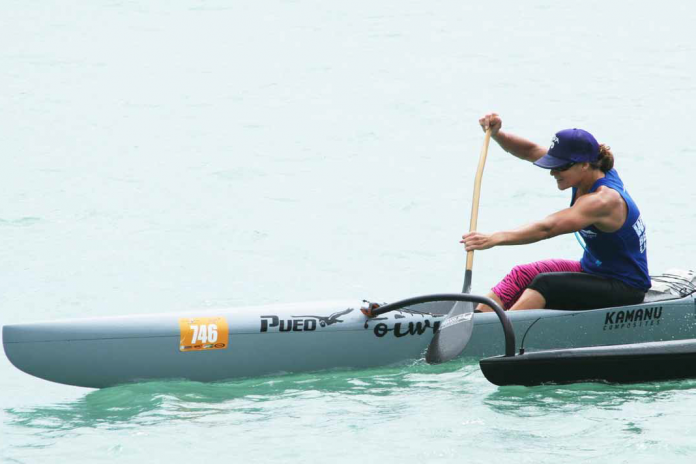 It can be said of hard-working folks that they “work their fingers to the bone.” For outrigger paddler Lindsey Shank, the expression applies quite literally. At the end of May, while she was training for the Molokai Solo, the premier OC1 distance race across the Kaiwi Channel, an x-ray revealed that what had started out as stress fractures had become two full-blown broken back ribs—she had paddled not just to the bone, but right through it! The doctor ordered no paddling for a minimum of two months. Rather than feeling helplessly benched, Lindsey characterized this injury as an opportunity for “a fresh start—a chance to come back and learn how to paddle more correctly.” At the time this magazine went to press in mid-August, her doctor had just given her the green light to jump back in the canoe with the Waikiki Beachboys to finish out the long distance season. 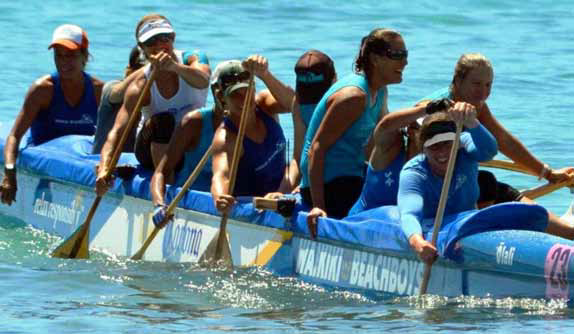 The “Beachgirls” are the defending Na Wahine O Ke Kai champions. 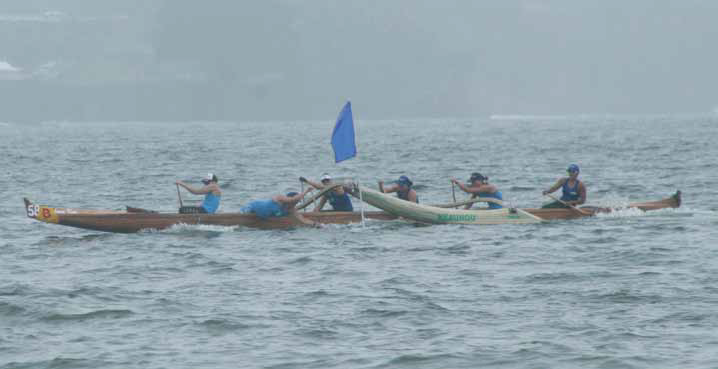 For the past several years, the channel crossing has been a rigorous battle to the finish against the seven-time Molokai winners Team Bradley. Bradley won in 2010, 2012, and 2013, and the Beachgirls prevailed in 2011 and 2014. The 2015 race promises to be as fierce a showdown as ever. If anyone’s up to the challenge, Lindsey is. As celebrated NFL coach Vince Lombardi noted, “The price of success is hard work, dedication to the job at hand, and the determination that whether we win or lose, we have applied the best of ourselves to the task at hand.” Applying herself is one of Lindsey’s hallmark traits, so it’s not surprising that she has found success in her wake. Going into college, Lindsey was offered a scholarship to Montana State University for ski racing, and then transferred to Central Washington University where she double majored in chemistry and biology, and then earned a MS in chemistry. At the same time that she was completing her second master’s degree—this time, in oceanography at University of Hawaii—she also mastered the OC1. The diligent scholar-athlete became state champion in the Kanaka Ikaika race series in 2012 and 2013. Over the years she has picked up sponsorships from Kamanu Composites, Makana Ali‘i, and Maui Jim. While her bones were fusing back together, Lindsey shifted her energy toward diversifying her workouts and coaching the Beachboys’ Open Women. It was during this “rest” period in the middle of regatta season that the affable 33-year-old sat down with me over a bowl of frozen yogurt on a hot, summer afternoon to talk about paddling, training, work, family, and the common thread of commitment that runs through them all. I heard you were a downhill ski racer. That’s quite a contrast from paddling in Hawaiian waters! Yes, my hometown is Wenatchee, Washing-ton, halfway between Seattle and Spokane in the foothills of Cascade Mountains. I grew up waterskiing and playing on the Columbia River. In the summertime, there was mountain biking, and in the wintertime, there was skiing. When I’m not paddling, I like to get into the mountains as much as I can. You mentioned that both ski racing and open-ocean paddling get your adrenaline going. Are their other similarities? It seems silly to say “yes,” right? The two sports seem so different, like complete opposite ends of the spectrum. It’s not so much that they’re similar, but the skills I acquired during my ski racing career help with open ocean paddling. First off, ski racing allowed me to build “body awareness,” the ability to know exactly where every part of your body is in relation to other things: objects, other body parts, etc.—kind of like depth perception, but for your entire body. This seems like a simple concept, but I’ve noticed over several years of coaching that not everyone has this ability. In ski racing you absolutely must exercise great body awareness because speeds are so high, and things come at you so quickly. In open ocean paddling, especially surfing downwind, you use the same skill to aid in bump selection: when to stay on a bump, when to push for the next one. Finally, there is visualization. In ski racing the runs are only two to two-and-a-half minutes long, and therefore visualizing the entire run is easy—you’ll do it 100 times before your race. It’s a little more difficult to apply to a race as long as, say, the channel, but it works the same way. I visualize the start, the course, making good bump decisions, my stroke, and of course, the finish. Visualization is an incredibly powerful tool, and I’ve even used it throughout this rib injury. Every day I visualize the way I’m going to change my stroke in order to prevent another injury. I visualize how changing the stroke is going to feel differ-ent, how the muscles will work differently. How does your training time fit in? What’s your usual regimen? I start work at 6:30am and get off at 3pm. That gives me enough daylight to get in the water after work. If I go before work, I have to be in the water by 4:15 and out by 5:30. So in the mornings I’ll often run or work out at the gym on base. Each week I do one long interval day, one short sprints day, and one long [distance] day. I keep all three, even in the off-season. Then I have fillers that also help me clock miles and time—experience—on the water, like downwind days… I try to be the best paddler I can be in all conditions. You never know what is going to be handed to you on race day! Tell us more about what you do at work. Whether for work or for play, you spend a lot of time on, near, or in the water. How would you describe your connection to the ocean? Speaking of respect for the ocean, what’s your most terrifying moment at sea? Paddling teaches you the power of camaraderie, as well as the value of having great teachers. What’s your relationship with your teammates? Is there someone who helped mentor you? Inspiration and support can make all the difference. You’ve credited your family as your biggest supporters. What did they teach you? “I joke with my parents that they need to write a book about raising kids. They al-ways let me be me. They gave me every opportunity to do what I wanted to do. They were always supportive. They are amazing parents. They stressed it was important to be happy and be who you are, and don’t let anyone else tell you what you need to be. What are your favorite paddling events? 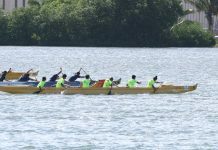 “My favorite events are the Molo Solo and Na Wahine. It’s a great feeling of accomplishment to paddle an entire channel, to know that you did that whole thing all by yourself. And in the Na Wahine, you get to do it with your sisters, your friends, some-times family. It’s different every single time. No two crossings are ever the same. Na Wahine has been an all-out battle to the finish over the past several years—it makes it so exciting for spectators. What happens when you get to the most grueling moments and you hit a wall? What separates first from second place? “Preparation separates first and second place. Sometimes it’s the small details: quick changes, fast bailing, etc. Or some-times the bigger factors like fitness, mental toughness, and desire. You have to prepare and practice the small details, you have to prepare for every condition, you have to prepare yourself to hurt, and you have to prepare yourself to look past the pain and keep going no matter what. Do you have more goals in paddling?